Home » What's New » What is Convergence Insufficiency? When a child has trouble at school, it isn't always a learning disability. It's important to be aware that the child could be suffering from a hidden but very real vision problem that hinders learning at school. It's called Convergence Insufficiency (CI). In short, CI is a near vision problem that negatively impacts your ability to see things at close distances. This means that a person with CI would struggle with reading, writing and working on things, even if it's a book or activity just in front of them. A person with CI has a hard time, or is more or less unable to coordinate his/her eyes at close distances, which makes everyday activities, like reading, very difficult. And because they want to avoid double vision, CI sufferers put in extra effort to make their eyes turn back in, or to use the correct medical term, converge. And this additional strain can often cause a whole lot of frustrating issues like eyestrain, headaches, blurry or double vision, sleepiness, difficulty concentrating, and reduced comprehension even after relatively brief periods of reading. Additional issues include difficulty doing computer work, desk work, playing handheld video games or doing crafts. Other occurrences that may indicate CI are if your son or daughter often loses his/her place in a book, squints or tends to shut one eye, struggles to repeat what they just read, or describes how the words they look at appear to move, jump, swim or float. It's not rare for all these symptoms to worsen as a result of illness, not enough rest, anxiety or too much time spent working. CI is often misdiagnosed as learning or behavioral issues like ADD, ADHD, dyslexia or anxiety. And furthermore, this vision problem slips under the radar when a child gets a simple eye exam using only an eye chart. Anyone can have 20/20 vision, while having CI, and not be able to develop the visual skills needed for reading. The good news is that CI can be expected to respond well to treatment. 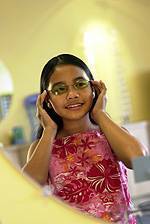 Treatments generally involve supervised vision therapy with reinforcing practice sessions at home, or the use of prism glasses, which can decrease some symptoms. Sadly, most people aren't tested properly, and as a result, aren't getting the treatment they need early enough. So if you've noticed that your child shows signs of having a tough time coping with any of the symptoms mentioned above, make an appointment with your eye doctor to discuss having that loved one tested for CI.